Principal Cast : Charlie Chaplin, Eric Campbell, Lloyd Bacon, Albert Austin, Edna Purviance, Charlotte Mineau, Leo White, Henry Bergman, Frank J Coleman, Bud Jamison, James T Kelley, Tom Nelson, John Rand, Wesley Ruggles, Tiny Sandford. Synopsis: The Tramp is tricked into impersonating an embezzling floorwalker in a department store. The first of Charlie Chaplin’s short films under the Mutual Film Corporation banner, The Floorwalker is notable for several firsts in cinema. 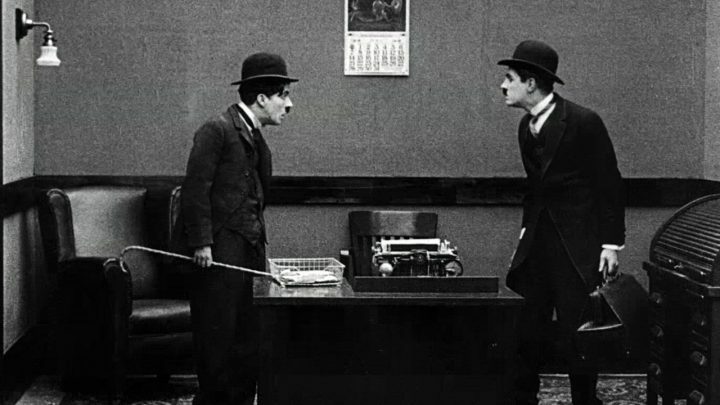 Ostensibly a mistaken-identity routine coupled with Chaplin’s frantic Tramp-inations, the 30 minute film is the first known example of what would come to be known as the “mirror sequence”, that is: two characters performing in unison opposite each other, as if in a mirror. 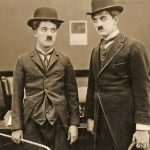 It’s an old trick today, but in 1916 I’ve every expectation that Chaplin’s use of the comedic staple was revelatory and send audiences into a frenzy of laughter. 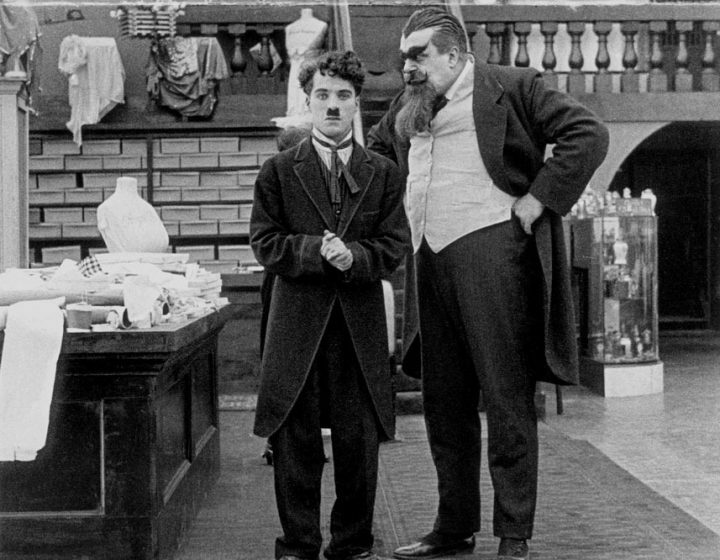 The film also marks the first time Eric Campbell would work with Chaplin, playing the enormous department store manager with unique facial hair (a look he would perfect and continue to use in each of the Mutual shorts made with Chaplin, until the actor’s untimely passing in December of 1917) who became the filmmakers default Bad Guy through his sheer size. While The Floorwalker isn’t the most memorable of Chaplin’s Mutual shorts, it’s among the most historical. The Tramp (Chaplin) enters a department store about to run into chaos. The general manager (Campbell) and assistant manager (Lloyd Bacon) are trying to embezzel money from the business and escape before they’re caught. The GM’s assistant (Edna Purviance in a minor role) knows nothing, while the shop assistant (Alber Austin) is confounded by the Tramp’s cavalier attitude to store property. When the assistant manager and the Tramp realise they look nigh-identical, and decide to dress as each other, hilarity ensues when a store detective (Charlotte Mineau) and an excitable old man (Henry Bergman) also enter the store to see what’s what. The Floorwalker begins with a manager receiving word that his shoddy scheme to steal money is about to come undone, and concludes with a hilarious escalator chase in which Chaplin’s Tramp and said manager are scampering wrong-way-down a moving staircase, an image that would come to epitomise not only Charlie Chaplin’s career on screen but also silent film altogether. There’s broad fun in The Floorwalker’s inventive narrative, a quicksilver con-game gone awry mixed with the Tramp’s gleeful playfulness, even if the film’s caper-esque conclusion does feel too drawn out to fire on all cylinders. Chaplin makes the laughs come from the most minuscule moments, his ability to find humour in the simplest of things is astonishing, and alongside hilariously mustachioed Albert Austin – a regular Chaplin player – the little fellow positively oozes comedic value. The film’s two main interest points, other than Chaplin himself, are the famous “mirror sequence” and the staircase/escalator chase. The mirror sequence in this film would inspire a similar scene in 1921’s Seven Years Bad Luck, and again in the Marx Brothers’ classic Duck Soup. Built on the premise that one character mirrors the actions and performance of a second actor perfectly has become a standard comedy routine for generations since, and although clunky by today’s standards the one featured in The Floorwalker, between Chaplin and Lloyd Bacon, is entertaining to say the least. So too the famous escalator chase, in which the Tramp and Eric Campbell’s cheesy villain race the wrong way down a rapidly moving staircase, to incredible comedic effect. The comic timing of all the performers is a true delight. The problem with The Floorwalker (and it feels sacrilegious using that word in a Chaplin review) is that the story is stretched far too thin for even this 30 minute film to accommodate. The story is threadbare, held together by Chaplin’s ample charm, and were it not for his charisma during the farcical final act, the whole thing would simply fall apart. Inventive comedy requires not just broad slapstick or physical pratfalls, but heart, and unlike, say, The Immigrant the following year, this film’s heart belongs to technicality rather than creativity. Purviance is lamentably short-thrifted here, appearing only in a minor role and it shortchanges Chaplin’s Tramp not to have a focus on something other than the film’s central premise. Eric Campbell, a stand-up straight man for Chaplin’s antics, is a delight as the scheming manager, his screen-filling size providing a dastardly villain for the Tramp to work against. Lloyd Bacon is Chaplin’s accomplice in the famous mirror sequence and acquits himself well in parodying the Tramp’s famous shuffle and mannerisms. 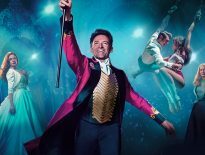 But the climax takes a little too long to work up to, a little too much effort to accommodate, and had the film chopped five or ten minutes of fluff (a lot of Chaplin’s “comedy” in the opening act of the film is shallow fluff at best) it would have been a leaner, meaner, more energetic romp. That said, The Floorwalker contains all manner of hidden treasures for silent fans to spot, and for cinema fans to savour. Charismatic pantomime performances, a well designed set, practical comedy and a sense of zinging comic timing all combine to give the film a real push as a classic of the genre. It isn’t, however, though not through lack of trying. While offering some historical cinematic mythology, The Floorwalker is at worst average and at best above average. 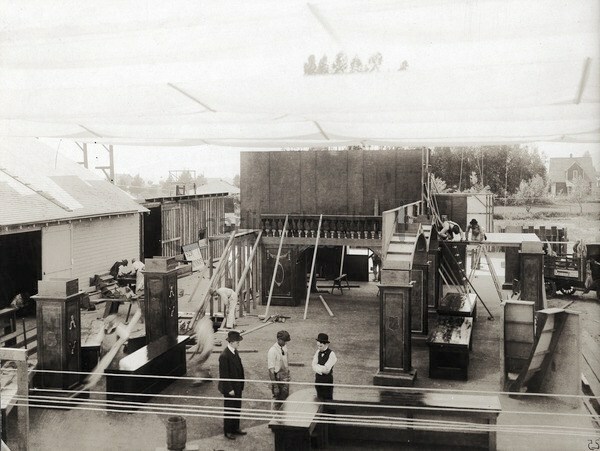 Charlie Chaplin overseeing construction of the Floorwalker set on his Hollywood backlot, circa 1916.